The synagogue is not identifiable, but it appears not to be the shrine of Ezra the Scribe at Uzair. 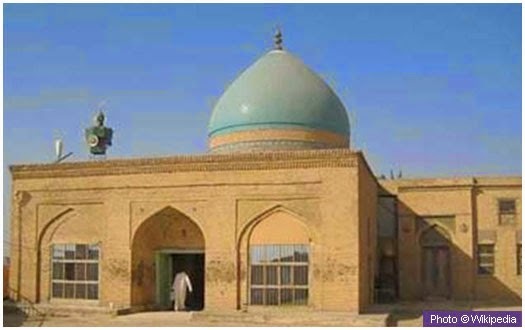 This holy site remains under the control of the Shi'ite Endowment, the news medium reports. A source told Al-Araby that armed militias seized the synagogue, which is near the Church of Sorrows, and cut off all the streets leading to it. They prevented journalists from filming or writing any reports on it .The militia destroyed the bulk of the site, intending to make the site its general headquarters in southern Iraq. According to an Iraqi 'Jew', the takeover by terrorist outlaws of the synagogue is not new; he was forced to leave his hometown after receiving direct threats to his life if he leaked the issue to the media. The 'Jew', who declined to be identified, criticised the Iraqi authorities for their silence in the face of violations against Muslim and other religious sites and suggested an appeal to the international community and the United Nations.